The 15th Annual Charlotte Harbor Nature Festival will be held Saturday, November 22, 2014 from 10 a.m. to 3 p.m. at the Charlotte County Sports Complex located at 2300 El Jobean Rd/SR 776 in Port Charlotte. Please help celebrate the splendor of the natural environment of Southwest Florida by sponsoring, exhibiting, volunteering and promoting this event. 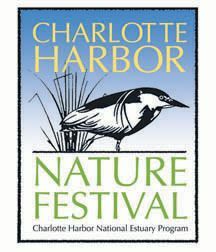 The CHNEP invites public participation as a sponsor, exhibitor, volunteer or promoter of the 15th annual Charlotte Harbor Nature Festival, making it bigger and better than ever. To register as a sponsor or exhibitor, click on the link below.